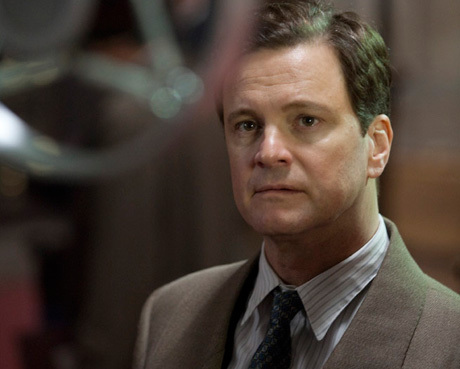 Last year, Colin Firth was tapped to win an Oscar for A Single Man, and this year with his stellar performance as the Duke of York, who would later become King George VI ,in The King's Speech, he may just walk away the man with the most cake. Directed by Tom Hooper (The Damned United), The King's Speech, which premiered at this year's Toronto International Film Festival and is based upon true events, follows the Duke of York (Firth), son to King George V (Michael Gambon) and brother to King Edward VIII (Guy Pearce), as he tries to overcome a speech impediment he's had since infancy. With the advent of radio wireless technology, the significance of the Royal family's communications to the British public has become of utmost importance, especially with Heir Hitler's threats rumbling in the background, and King Edwards' scandalous affair with Wallis Simpson bringing the royal family into disrepute. The Duke and his wife Elizabeth (Helena Bonham Carter, who for once isn't playing a Tim Burton, gaudy monstrosity) seek out the services of Lionel Logue (Geoffrey Rush), a speech therapist from Australia, and sometimes actor, to cure the Duke in preparation for the most trying radio speech he'll ever give. Hooper takes a script that easily could have been another stuffy costume drama about ponce-y people sporting posh accents and bumbling about like they've giant gherkins thrust up their backside, and turns it into the most endearing, finely tuned Royal family portrait, with a streak of tawdy-dalliances, since The Queen. Sequences of outright buffoonery told in boldfaced type land on the right side of cheeky cleverness, such as a key montage of the Duke and Logue performing rigorous, yet ridiculous, vocal training (i.e., rolling around on the floor, shouting vowels and pushing Elizabeth up and down on his belly). The script teems with myriad interesting ideas and detours concerning the public's view of the stuffy Royals, but never too many. When the Duke informs Logue that all previous doctors told him his stuttering was fine, and Logue thusly calls them idiots, the Duke responds, "They've all been knighted." "It's official then," deadpans Logue. And "Fornication?" is the Duke's response when asked if he knows the F word. The tennis match dialogue chirps with acid-soaked burns, while the marriage between common man and regal statehood is pleasingly successful. The dynamic created by Firth and Rush is compelling and downright funny. Geoffrey Rush, like a lad on a third date no longer concerned with sucking his gut in, lets it all hang out. His performance assembles the blurry fragments of a periphery character from history into a grand mosaic. Director Hooper fashions each scene like delicate gossamer, manipulated, shaped and carved to echo the grand scheme in his head - a roaringly beautiful, mysterious thing. Helena Bonham Carter is so precious and sweet as the young Duchess, who would later become the Queen Mother, she could surely dissolve on your tongue.